In my tutorial Bean autowiring in Spring framework, I showed to you all three ways to automatically put an object dependent on a dependent object without having to use the ref, idref, or list attributes. In this tutorial, I will introduce you another way of doing this, which is using @Autowired annotation. Let’s take a look at how to use this annotation! 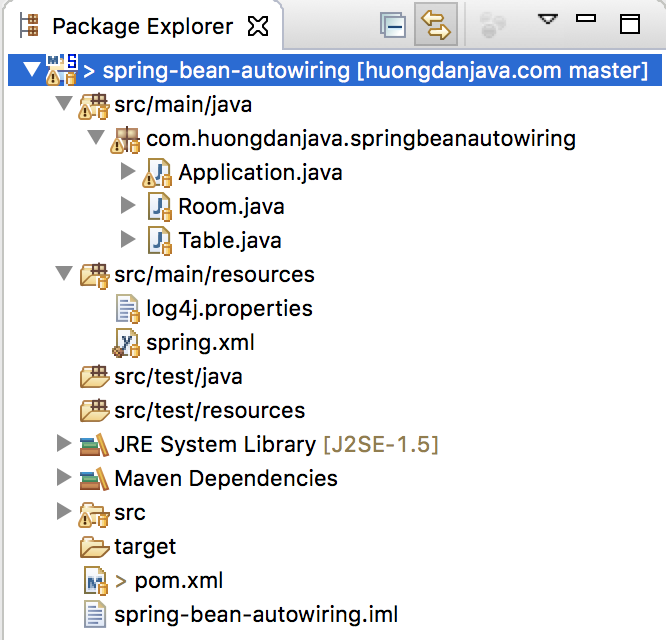 I still use the example in the tutorial Bean autowiring in Spring framework for the example. You will see the bean table no longer beaned in the bean room. OK, now we will use @Autowired annotation to bring the bean table into the bean room again. <context: annotation-config /> tag is used to dynamically initialize the appropriate objects relate to the annotations that have been declared in the bean to register with Spring container. I will write a post about this tag for you to understand more. In this tutorial, I use the <context: annotation-config /> tag to automatically initialize the AutowiredAnnotationBeanPostProcessor object because we are using the @Autowired annotation.